Before I left Singapore for my Christmas vacation in the Philippines. I made sure that my Wifey will be happy when I arrive home. I ask her what she likes for a "pasalubong", a present. 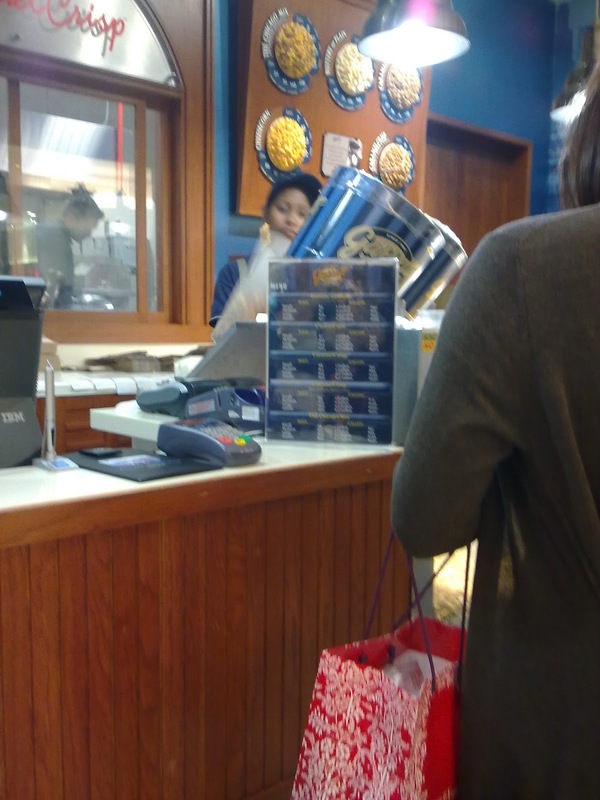 She said a 1-gallon popcorn in a can and the brand is Garrett. Where can I find Garrett Popcorn in Singapore? There is one Garrett Popcorn branch inside Sentosa and is near to the entrance of the Universal Studios. To go there, ride the MRT to Harbourfront station and head through Vivo City to transfer to the Sentosa train. Alight at the first station of Sentosa and walk your way to the entrance gate of Universal Studios. 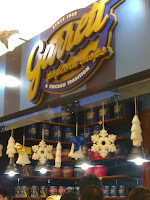 Garrett Popcorn is located just before the gate entrance, right beside the Universal Studios globe. No time for me to go there so I decided to go to the second branch, which is in Cityhall. The Garrett Popcorn is just along the hallway beside Hersheys, left side when going to (Esplanade, Suntec and Marina Mall) from Cityhall, MRT Station. 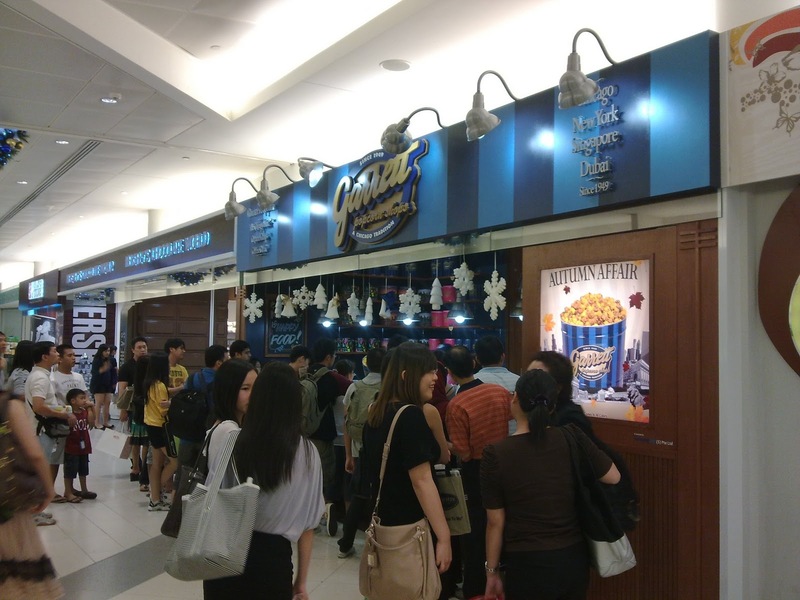 Are there any Garrett Popcorn Locations in Singapore? Yes, there are three more branches, they are in Great World City, Parkway Parade and Tampines Mall. 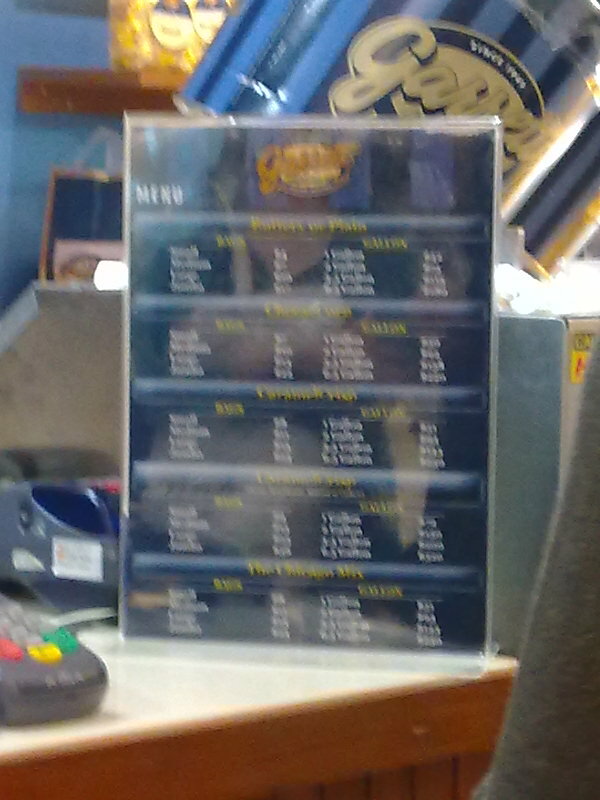 How much is the Garrett Popcorn? To my surprise, Garrett is expensive! I took a picture of the price list but unfortunately, it's blurry. To give you an idea..
1-gallon of Caramel Flavor costs S$51.00 in a can. 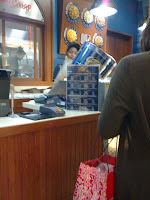 1 large size Chicago Mix(Caramel and Cheese corn) costs S$13.00. But I tell you, the taste of Garrett Popcorn is soooo damn good, try the caramel flavor...you'll forget the price after you taste it. Try it and tell me if I'm bluffing. Hi Atiqah, if you're in Singapore, read the post above and it will lead you to Garrett popcorn. There are 4 outlets in Singapore. In Sentosa island, raffles city, parkway parade and Tampines mall. Nearly everyday I pass by 2 ofthe stores cos one is near my workplace while the other is near my home. That's why I have a container of pop corn both at home and in my office. I had so much of it till I m getting pretty sick of it. My name is Parveen Tay and I am the Corporate Sales Executive for Garrett Popcorn Shops®, Singapore. Let us join to say thanks, congrats and hooray! Business-to-Business gifts, employee recognition, client appreciation, meetings, or special events… Garrett Popcorn is the perfect gift for any occasion. Thank you for your time! I look forward to hearing from you! Where is the shop location in Changi Airport? Sorry, there is no Garrett Popcorn at Changi airport.